Clean the fish thoroughly, coat with salt and turmeric powder, and keep it for 20 min. Make a fine paste of onion(100gm),ginger and garlic. Cut thin slices of the remaining onion and tomatoes. Peel the potatoes and cut them into cubes and boil it properly. Take a deep pan, heat oil in the pan, fry the fish pieces 1 or 2 at time till they are turns golden brown on both sides. Remove from flame and keep aside. Now in the remaining oil in the pan, put the onion slices, fry them till its turns golden brown. Add the masala paste to it. Stir it well. When oil starts comes out, put the tomato pieces. Fry it till the tomatoes are well cooked. Add the boiled potatoes to the above masala,. turmeric powder, salt as per taste. stir it for 2 min then add 3 cups of water, Cook it till the potatoes are well cooked; now add the fried fish to the gravy. Cook it for another 10 min. remove from flame and serve it with rice or roti. 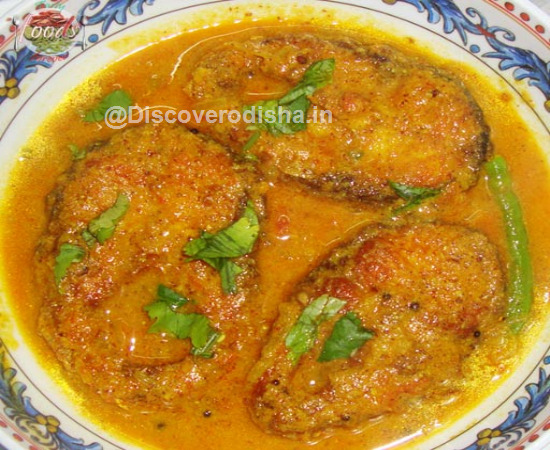 Rohi Machha( Rohu Fish)- 750 gm Aloo(Potato)-250 gm Piaja( Onion)- 150 gm Tamato- 75 gm Rasuna(Garlic) – 20 gm Sorish Tela( Mustard Oil)- 50 gm Sukhila Lanka( Dry Chili)- 1 pcs Ada( Ginger)- 1 inch Lanka Gunda(Chili Powder)- 1tsp Haladi Gunda( Turmeric Powder)- 3 tsp Salt- as required.